Sarasota County officials will debut the county's newest solar photovoltaic (PV) array at the Sarasota County Operations Center, 1001 Sarasota Center Blvd., Sarasota, at 11:30 a.m. Wednesday, Sept. 19. This is the first major solar array powering a county building and represents an important step toward increasing the use of renewable energy in county facilities. Sarasota County also uses solar technology through solar-powered signs, gates, parking lot lights and traffic devices. 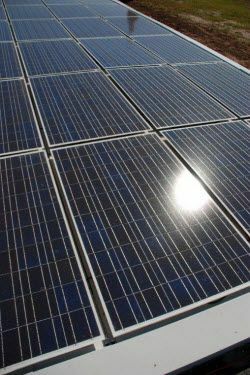 A 10-kilowatt (kW) film PV system also is featured on the Leadership in Energy and Environmental Design (LEED) Gold-certified Sarasota County Extension Office, along with solar hot water installations on county buildings. The new 57-kilowatt solar PV system has 224 panels projected to produce 86,194 kW per year, 5-6% of the building's power use. The system is expected to save $7,900 a year in taxpayer dollars for building electricity. A monitor in the building lobby continuously displays the power collected by the panels. The array was made possible by a U.S. Department of Energy grant and received a rebate from Florida Power and Light's Solar Rebate Program. A free solar energy class will be offered at 9 a.m. before the dedication. Residents will be able to learn about advances in solar energy, installing a solar energy system, and how much a system could reduce their energy bill. Space for the free class is limited and advance registration is required. To register, visit www.scgov.net, click on Calendar, then select Sustainable Sarasota from the drop-down event list. The class will be taught by certified instructors from Solar Source, the contractor that installed the system. The Solar Source Institute Mobile Training Unit will be on display in front of the Operations Center. Professionals will be available to answer questions about solar technology from 11:30 a.m.-1 p.m.